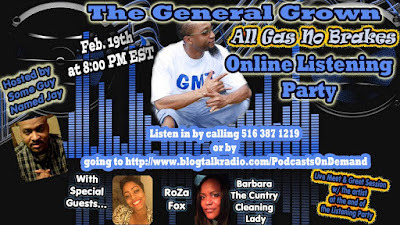 The General Grown ALL GAS NO BRAKES Online Listening Party will be held on Feb. 19th at 8:00 PM EST! Live Meet and Greet Session with the artist at the end of the Listening Party! Hosted by Some Guy Named "Jay" with special guests RoZa Fox and Barbara the Cuntry Cleaning Lady to open up the event.